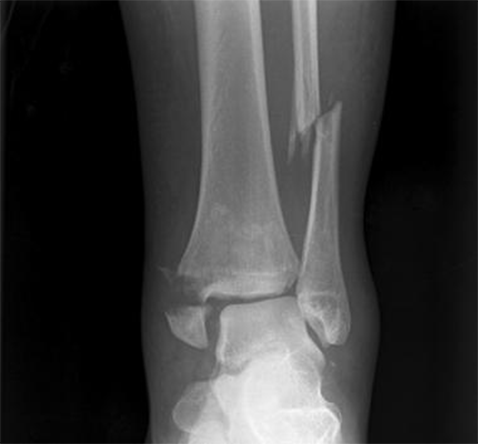 Fractures occur when a bone breaks from a blow or a fall. A fracture may be classified as a hairline fracture (a thin fracture that may not run through the entire bone), a displaced fracture (the bones are out of place) or a compound fracture (the broken bone protrudes through the skin). Stress fractures are weak spots or small cracks in the bone caused by continuous overuse. There usually is no swelling, but pain and tenderness often increases during movement. It is usually obvious to the patient once a fracture has occurred, the area is usually very painful and swollen and it may be deformed. Immediate treatment consists of resting of the painful part (for example in a sling or simply elevated). Use of something cold will help control swelling. Ice is suitable but should always be wrapped in something (e.g. a towel). Medical advice should be sought immediately, remember that the patient may require an anesthetic for treatment of these fractures and so avoid food or drink until a doctor has seen the injury. Almost always an X-ray (radiograph) is required to make an accurate diagnosis of fractures and to decide upon the correct treatment. There are several parts to treating fractures. First, the two parts of the fracture must be put back in their original position. Once the fracture is reduced, it needs to be kept in the correct position until the bones have a chance to heal, this will take about six weeks. The third part of fracture treatment is to ensure that any soft tissues are kept mobile to ease transition back to normal use. Splints and casts support and protect injured bones and soft tissue, reducing pain, swelling, and muscle spasm. 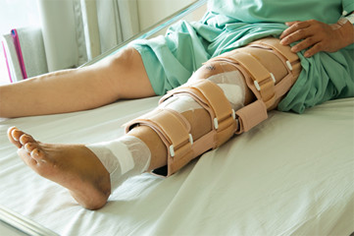 In some cases, splints and casts are applied following surgery. Splints provide less support than casts. However, splints can be adjusted to accommodate swelling from injuries easier than enclosed casts. Casts are custom-made and applied by your doctor or an assistant. Splints also can be custom-made, especially if an exact fit is necessary. Other times, a ready-made splint will be used. Splints have Velcro straps which make them easy to adjust, put on, and take off. Your doctor will explain how to adjust your splint to accommodate swelling. Splints and casts use padding, usually cotton, as a protective layer next to the skin. The splint or cast must fit the shape of the injured arm or leg correctly to provide the best possible support. Generally, the joint above and below the fractured bone also is covered by the splint or cast. Frequently, a splint is applied to a fresh injury first and, as swelling subsides, a full cast may be used to replace the splint. Sometimes, it may be necessary to replace a cast as swelling decreases and the cast “gets too big.” Often as a fracture heals, a splint may be applied again to allow easy removal for therapy. Often when the splint or cast is first fitted, pain and discomfort can follow because of swelling. Elevate your injured limb above your heart for at least 72 hours by Elevate your injured limb above your heart for at least 72 hours by propping it up on pillows or some other support. Move your uninjured, but swollen fingers or toes gently and often. Apply ice to the splint or cast. 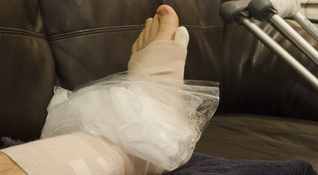 Place the ice in a dry plastic bag or ice  pack and loosely wrap it around the splint or cast at the level of the injury. Keep your splint or cast dry. Moisture weakens plaster and damp padding next to the skin can cause irritation. Use two layers of plastic or purchase waterproof shields to keep your splint or cast dry while you shower or bathe. Do not walk on a “walking cast” until it is completely dry and hard. It takes about two to three days for plaster to become hard enough to walk on. Do not pull out the padding from or remove any pieces of your splint or cast. If your cast begins to  deteriorate, contact your physician. Do not stick objects such as coat hangers inside the splint or cast to scratch itching skin. Do not apply  powders or deodorants to itching skin. Inspect the skin around the cast. If your skin becomes red or raw around the cast, contact your physician. Increased pain, which may be caused by swelling, and the feeling that the splint or cast is too tight. Burning and stinging, which may be caused by too much pressure on the skin. Are you suffering from a fracture? Get treatment now to prevent further damage. The Lake Pointe Orthopaedics team is here to help.